It’s odd. 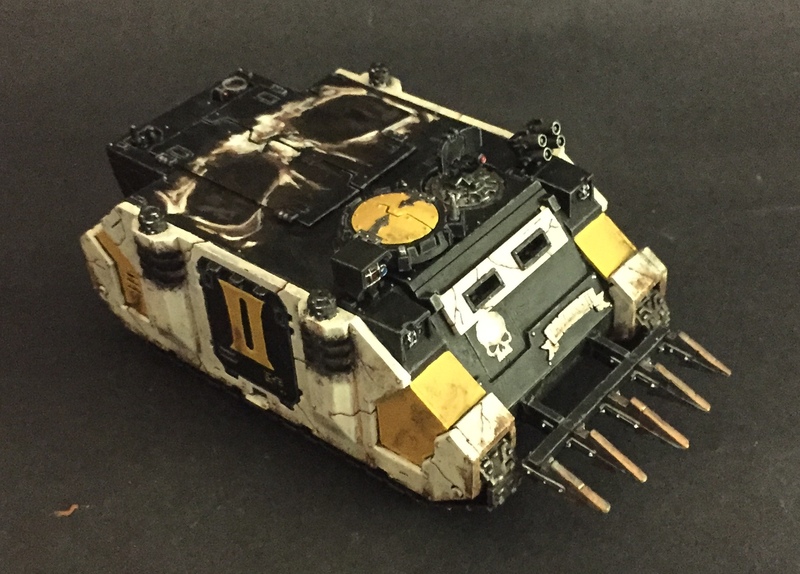 Whenever I say ‘it’s going to be quiet around here for a while’ I invariably end up posting something up within a couple of days, and true to form, may I present to you my second Mortifactors Rhino. 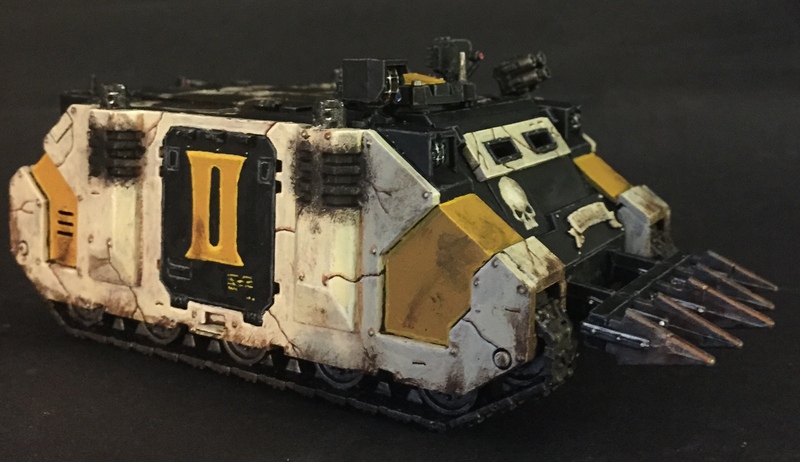 Turns out the somewhat understated (read boring) APC can actually be a lot of fun to paint. I started this a while ago. In fact, I kind of started this Rhino about three years ago. 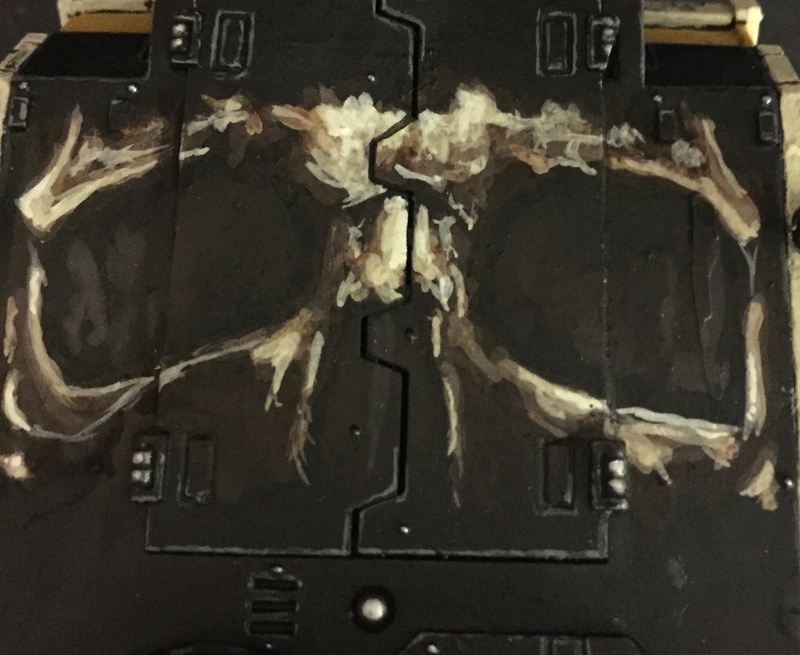 It used to belong to the Emperor’s Children (the first army I painted up when I got back in to the hobby) and it looked bad (seriously bad). 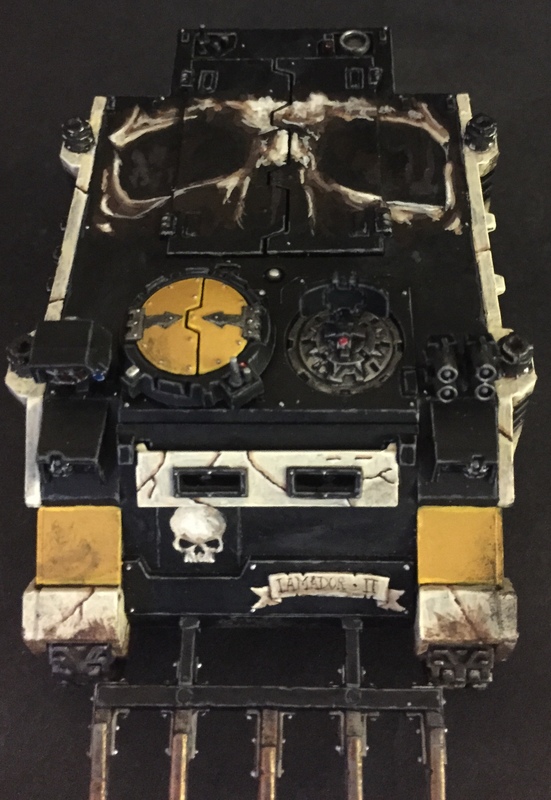 Like the rest of that army, it was wasting away in a drawer, so rather than splash the cash on a new one, I got out the Fairy Power Spray, changed a few bits and undercoated it black in preparation to become a Mortifactors armoured transport vehicle. 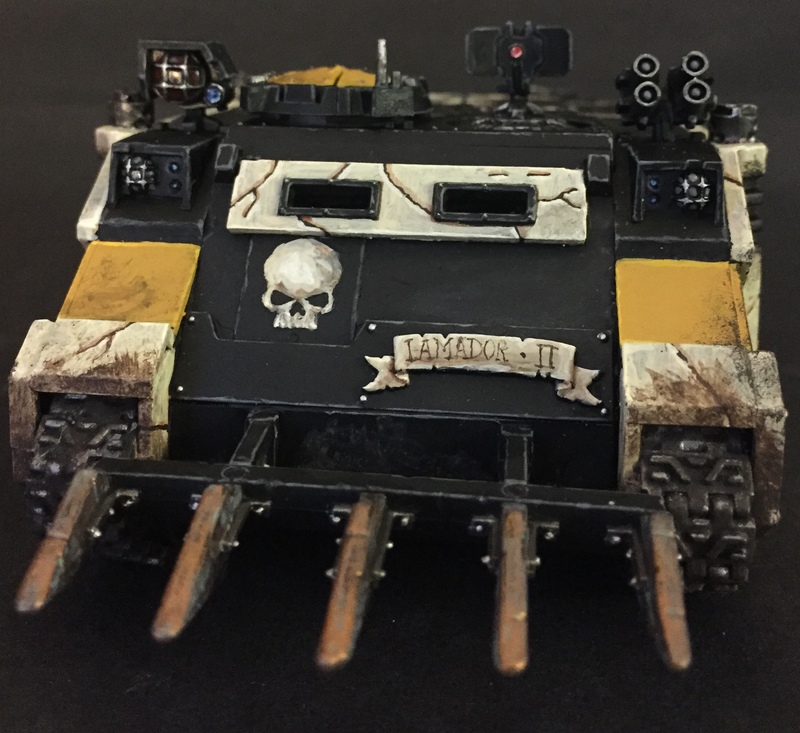 And because of the questionable activities of the Chapter from Posul, a Chaos Rhino makes for a better kit than a loyalist one for these guys. I don’t need all the spikes, but a couple of spikes give it the edge it needs. 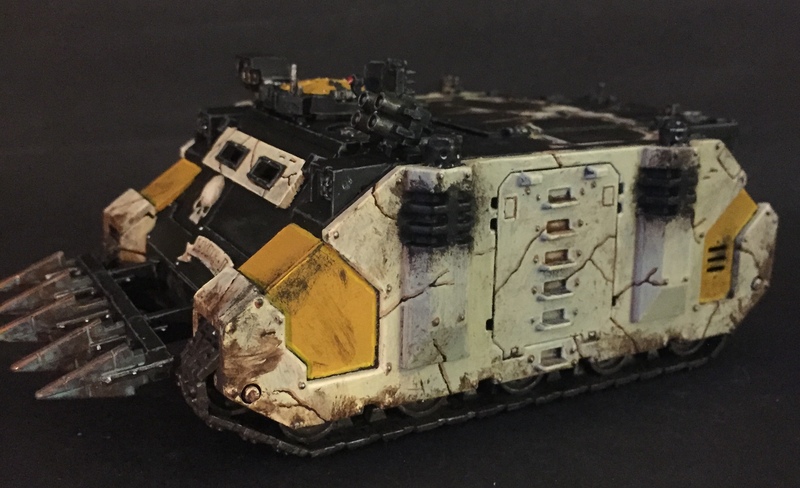 As this Rhino belongs to Squad II, Second company, its designation is there on one of the doors for all to see in the yellow that really makes this colour scheme pop. It’s in a slightly different style to the Squad IV Rhino that I worked on earlier in the year, but if I do another, I’ll want that to be slightly different too. I don’t like them all being uniform – that’s far too Ultramarine for me, and for the Mortifactors. Little differences that would make the OCD Ordo Astartes cry ‘Heresy!’ before being told to calm down are what’s called for with these chaps. The little banner on the front also bears the name of the sergeant, Iamador, whose unit rides inside. Anyway, on with the show. I hope you enjoyed that one – I certainly enjoyed painting it. I’m still not particularly chipper at the moment (hence the warning that this place may be a little quieter – which is probably a lie) and I’ve got a lot on, so who knows when the next piece will be ready to show you. I still want the 2000pt Mortifactors force done by the end of the year though, so I’m going for it. Only three things left to do now… Onwards!